Love her or hate her, Chinese Tiger Mom Amy Chua has a point: things are a lot of more fun when you’re good at them. I remember after my first ski lesson coming home, bruised and battered, muscles aching, covered in snow, pleading with my mother never to send me back to the slopes. Fast forward ten years and…well, still bruised and battered, muscles aching, covered in snow, but having the time of my life. In any activity, be it sport or art or academic pursuit, there’s a level of basic proficiency or understanding that has to be acquired before it becomes enjoyable. In music, that break point, that hump, seems to be much more difficult to cross, requiring many more hours of time and effort than for something like a board game or skiing. Those hours can be thankless and solitary, if your parent is Sino-feline in mentality, or they can be acquired in the company of, and with the support of, friends experiencing the exact same challenge, if your family ascribes to Ameri-Caribbean philosophies. 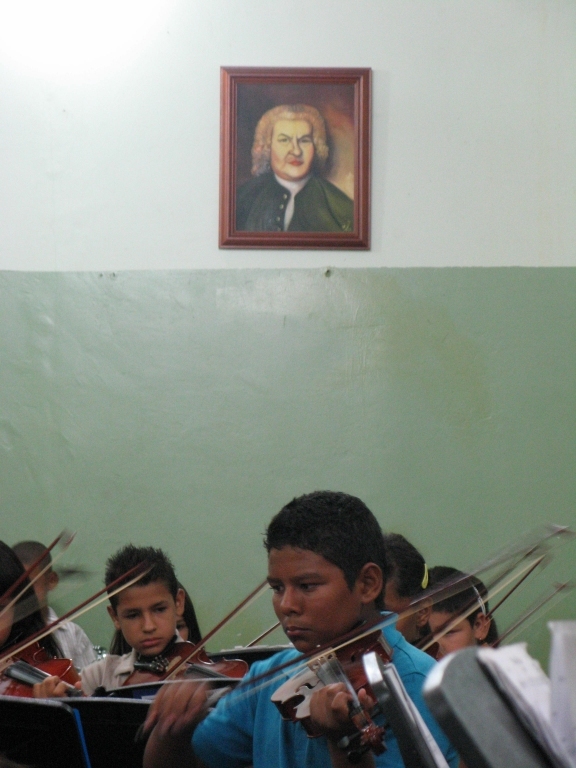 Not all of the “social” element in el Sistema is “social” in the exclusive sense of “community” – and this is one of the greatest pedagogical strengths of the program, surprisingly. The emphasis on ensemble, on hanging out with friends, makes those initial hours enjoyable by diverting focus from the frustrations of the instrument to the positive attributes of the surrounding experience. This is the root of the much-misunderstood mantra “passion before precision.” It’s not a question of sacrificing musical excellence in favour of an environment of unproductive fun; students ultimately achieve precision because the process itself is enjoyable. First the enjoyment is within the social nature of the experience, then it becomes inherent to the activity once a level of proficiency is achieved. Sorry Tiger Mom, it doesn’t have to be drudgery to be productive and character building. Getting over the “hump” isn’t just about reaching the inherent rewards, it’s an integral part of the confidence-building element of Sistema previously referenced here. Confidence, in this context, is virtually synonymous to Albert Bandura’s concept of self-efficacy, a term he used to describe our belief in our own ability to surmount or overcome challenges not previously experienced. This is an attribute that has to be acquired, well, experientially, ironically, and learning a musical instrument, developing technical proficiency and mastery, can be a key element in that process. I completely agree with you. There is a first (challenging) stage where enjoyment helps to survive the frustrations of the instrument. Children can see through their peers how changes occur, giving them the certainty that they can make it too.